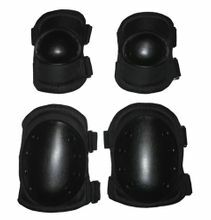 Non-reflective and durable, this Knee and Elbow Pads set is a favorite of SWAT, corrections, and tactical professionals for their light weight and extreme comfort. They fit comfortably over clothing for long term wear. Non-Slip flexible molded plastic contact area. One size fits all. Equally useful in the garden or doing chores around the home.